Baby is on the way, and everyone around the new mother is excited and happy for her, calling for a baby shower to celebrate this new chapter! There are many steps to throwing a baby shower and if you are the only one planning the baby shower for your friend, you have to take care of the invites, the food, the guests, the venue, the decorations, the games and activities and a hundred other miscellaneous things to do. Food is one of the biggest aspects of any party and it can be hard deciding whether to prepare a bash or just simple finger food to keep the guests occupied. 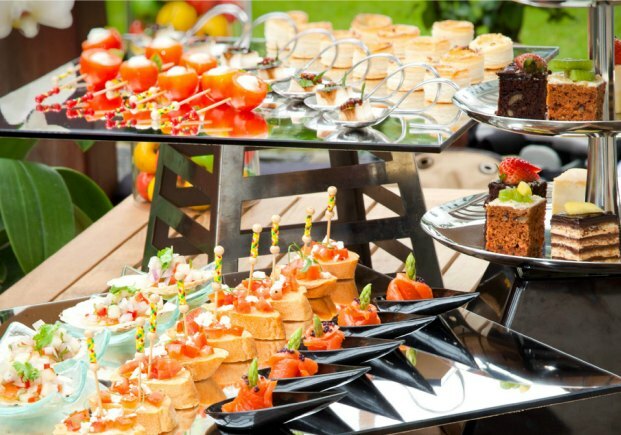 If you don’t want to have to think about all of those, here are 5 caterers you could use for your baby shower to save you the hassle. * Full set of disposable wares, serviettes, garbage bags, chilli & tomato sauce. If you order from JMJ Catering via Food line, you find that you get a discount, albeit not a very extensive menu. Makan Mate caters to all occasions, and you can choose from a variety of options such as BBQ buffets and bento sets. Shiok! Kitchen Catering is Halal certified, and adheres to the highest catering standards of both food and service. Some of the services Shiok! Kitchen Catering provides includes Bento catering, Buffet catering for both small house parties and large corporate events. Eatz catering provides service staff including wait staff, chefs and butlers to bring your event to the next level. They can even take care of dining logistics like providing and setting up of glassware and chinaware, tables and BBQ pits. They are eager to help you avoid the headache and save time when it comes to food catering. This entry was posted in Gift Ideas. Bookmark the permalink.